Would you like to know more on how to comply with the Horizon 2020 Open Access (OA) mandate and Open Research Data Pilot? How to make your OA repository or OA journal compatible with Horizon 2020 OA requirements? Have questions about success factors for OA and Open Data policies? 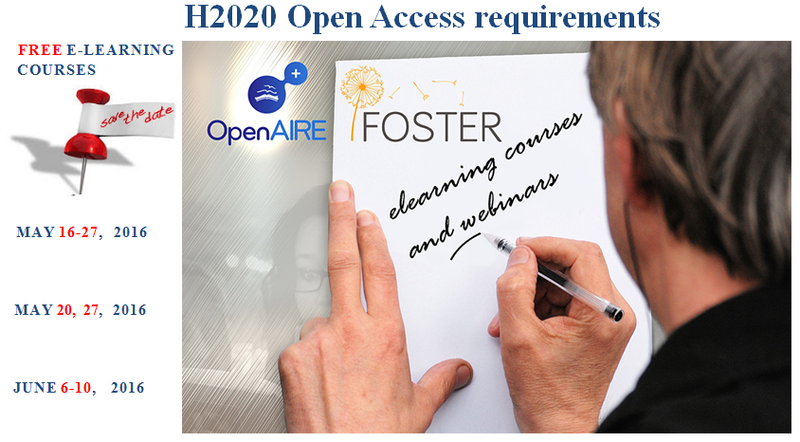 Join FREE e-learning courses and webinars provided by FOSTER project in partnership with OpenAIRE and PASTEUR4OA. Working in a research funding organization, following Open Access and Open Research Data policy discussions, but feel overwhelmed with lots of new developments? what elements make a successful Open Access policy; and how to develop an effective Open Research Data policy. The moderated course “Designing Successful Open Access and Open Data Policies” will run from May 16 to 27 and the webinar will take place on May 27 at 11:00 CEST. 20 May, 11-12 CEST: Good practices: What is the Open Data Pilot? What is required from signatories? JUNE 6-10, 2016, 11 CEST. Identify key resources and services that can help you to comply with requirements. To participate in the webinar, that will be hosted at http://www.instantpresenter.com/WebConference/Default.aspx?ip_ek=eifl147, all you will need is an internet-connected computer with sound (and maybe headphones if you are in a busy room). Are you working in a research funding organization and new to Open Access and Open Research Data?